Preheat oven to 350 degrees and place cupcake liners in cupcake pan. Grind Lemon Pucker Pistachios in a food processor or blender. Combine cake mix and its ingredients according to package directions. Add in pudding mix and combine well. Gently stir in ground pistachio nuts into batter. Fill cupcake liners about 2/3rd full with cupcake batter. Bake for approximately 18 minutes or until cupcakes are done. In a small bowl add cream and white sugar and beat until soft peaks form. Add remaining package of pistachio pudding and mix until incorporated. 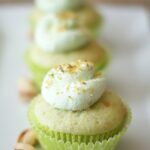 Frost cupcakes with pistachio cream mixture and store in the refrigerator until serving.